At least 257 killed as military plane crashes..!! 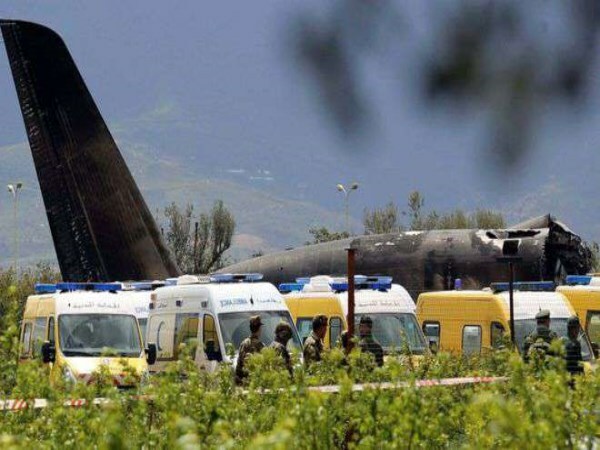 An Algerian military plane crashed on Wednesday near Boufarik airport near the capital Algiers. The plane was reportedly carrying more than 250 military personnel. At least 257 are feared dead in the crash, including 26 from Western Sahara, say Reuters. Some reports even suggest that there were at least two hundred people on board the aircraft. At least fourteen 14 ambulances are present at the scene. The injured are being rushed to the hospital. All roads near the airport have been closed for emergency services and for rescue operations to be carried out. Television footage showed black smoke billowing near a motorway and a crowd of security officials and others standing in a field next to the crash site. The tail fin of a plane could be seen above olive trees, with smoke and flames rising from the wreckage. The crash took place soon after take-off at Boufarik military airport near the capital, Algiers. The airport is a base used by the country's air force. As per reports, the plane was an Ilyushin Il-76 and was headed to the western Algerian city of Bechar. IL-76 is a medium-range military transport aircraft. Also known by the Nato codename 'Candid', the aircraft is mainly used to drop paratroopers, carry troop forces and combat material with crews and armaments, including medium-sized battle tanks, airlift cargo for troop forces and transport for disaster relief operations.